For those nights when you get home hungry, stressed, and impatient, Hangry is here to help. Each Monday, Kendra Vaculin will share quick, exciting meals that anyone can make -- whether you're in your first apartment or feeding a hangry family. Today: Instead of spending time to roast a whole chicken, use a store-bought rotisserie chicken to create a dish that's all your own. This is the first Hangry post to feature meat, which took a concerted effort on my part. I am definitely a carnivore -- a mountain of pulled pork once saved my life, and if a pizza doesn't have pepperoni I’m not 100% sure what it’s doing in front of me -- but I usually don’t stock animals in my fridge. Meat takes longer to cook (I’m hangry, after all), and I have a little bit of PTSD from my 20th birthday dinner party when I burned 10 stuffed chicken breasts all at once. It was, if nothing else, really impressive. Also a disaster. For these reasons, when in my own kitchen, I tend to veer pretty seriously in the direction of vegetables. With one exception: rotisserie chicken. If you have the time and will to roast your own whole chicken, you are beautiful and inspiring. You have really lovely dishtowels in your kitchen, probably, and a big bay window, and you grow your own herbs. Maybe you’re my mother? What I know for sure is that I am not among your ranks. I dream of the day that I will be more like you, but for now I go to the store and buy rotisserie chickens in warm plastic containers. The reason a whole cooked chicken is so awesome is that it acts as a jumping off point for an entirely new recipe. Eating one plain, while technically possible, is just so silly if you think about how close you are -- you have a chicken in your hand! -- to a myriad of other meal options, from salads and sandwiches to soups and pot pies. This herby dish with two kinds of peas is seriously addictive -- the kind you roast a chicken for, if you’re into that sort of thing. 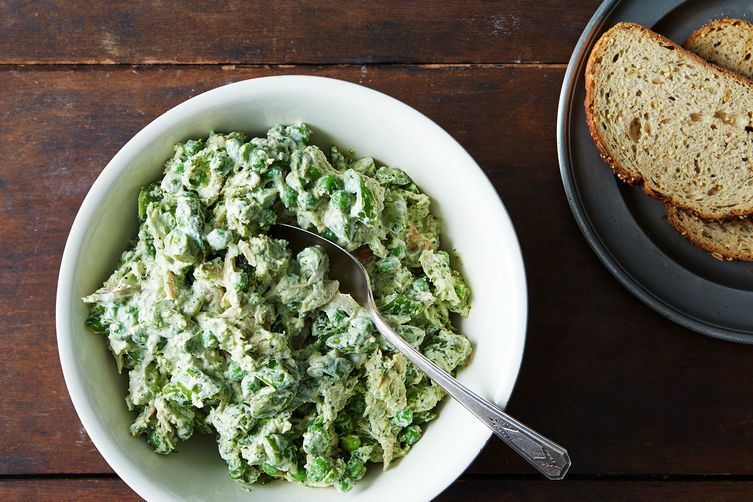 More: Since you didn't cook the chicken, you have time to make your own pesto for the salad. What's your favorite way to dress up pre-cooked or leftover chicken? Tell us in the comments! Make chicken stock or go one steps further and make chicken soup! 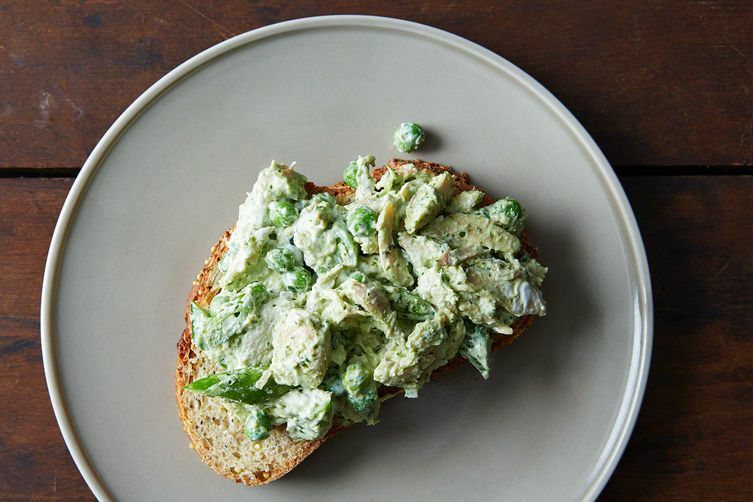 The poached chicken you make as a result is the best chicken salad base of any kind! And it takes about 3 more seconds of effort than using a rotisserie chicken. BR95510 I don't see anyone making comments about mental illness. I certainly didn't. And do not buy rotisserie chickens or any convenience foods but cook from scratch. I was speaking to the author of the article who said: "Meat takes longer to cook (I’m hangry, after all), and I have a little bit of PTSD from my 20th birthday dinner party when I burned 10 stuffed chicken breasts all at once." Our Veterans who have served our country and are now battling with PTSD would hardly see a chicken crisis as being similar. It's an insensitive remark. Ah I see what you mean. Although I'm sure it was unintentional, I can see it would be an insensitive remark to those who suffer from or have loved ones suffering from PTSD. Please don't make light-hearted comments about mental illness. And I agree with Kate's comments. Rotisserie chicken is just plain nasty. Roast your own when you have time and freeze it in the portions needed for recipes like these. Ooh, some of you are so mean. We all have to cut corners sometimes even if its tuna from a can when we need to grab something quick. This lady is just trying to be helpful and, yes when I try this recipe out I will cook my own chicken because I have the time to do it! I roast my own whole chickens because they taste way better than any rotisserie options that are over-cooked, and over-salted. It's cheaper overall and far more practical. And it isn't because I have lovely kitchen towels, a bay window and grow my own herbs. Can we please have some articles that don't resort to cheap generalizations to fill space? I don't think your the "hangry" target audience, Kate...I too, roast if I have time, and I dont think I own a kitchen towel. But, I definitely grab a rotisserie shamelessly if I am hangry because I am in a worked-way-too-late-and-don't-have-a-car-to-stock-up-on-groceries-ever. @luxe_surfaces we LOVE eating with our hands! This sandwich looks fab and needs the backdrop of one of our fabulous digital wall coverings - food/fashion photo shoot? Rotisszeri chicken cooled, mayo, curry powder, golden raisins, must be golden and slivered almonds, mix together and serve on sliced baguette. I serve this at all my lady type parties and it is always a big hit, and so easy! Another "recipe" from someone who can't cook for someone who can't cook.